After Sam's Club spilled the beans on Apple's iPad Pro release date earlier on Friday, authorized reseller MacMall is now showing preorder availability for the big-screen slate expected to ship on Nov. 13, complete with early-bird discounts. At authorized Apple dealer and AppleInsider partner MacMall, iPad Pro models start out at $787 for a 32GB Wi-Fi only version in Space Gray, silver and gold, representing a $12 savings over Apple's own price. According to the online storefront, shipments are expected to ship out within nine days, though recent rumors and a Sam's Club listing pegged launch for Nov. 13. It appears MacMall will have a full assortment of configurations up for sale at launch, as the company is showing preorder availability for all iPad Pro models. The step-up 128GB Wi-Fi only version comes with a similar discount priced at $937 for Space Gray, silver and gold, while the lone Wi-Fi + Cellular version with 128GB of storage comes in at $1,067.00 for Space Gray, silver and gold. MacMall is also showing preorder availability for the $99 Apple Pencil and $169 Smart Keyboard, though expected ship dates for those items is listed at four weeks out. Those interested in reserving an iPad Pro should do so sooner rather than later, as Sam's Club sold out of its pre-sale allotment in just a few hours. Cramming 5.6 million pixels into a 12.9-inch display, the iPad Pro is designed to maximize screen real estate and can run two full-size iPad Air apps side-by-side. The bigger display allows for a full-size soft keyboard and full support for Apple's latest iOS 9 multitasking features such as Split View, slide over and picture-in-picture. 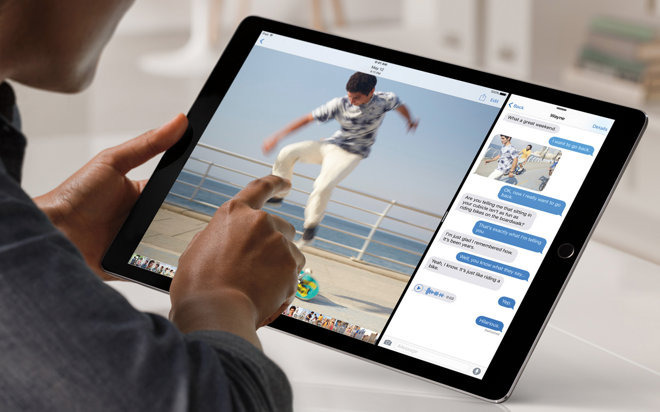 To power its beast of a tablet, Apple includes an A9X chip that is supposedly 1.5 times faster than comparable desktop processors and features graphics performance twice as fast as the already formidable A8X found in the iPad Air 2. Other features include an adaptive four-speaker stereo system, 8MP iSight camera, FaceTime HD camera, 802.11ac Wi-Fi and Touch ID.